Bruce Farquharson has been involved in Nanaimo’s music scene since 1977. 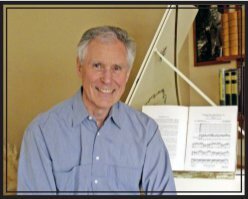 Formerly director of the Nanaimo Tidesman Barbershop Chorus, A Capella Plus, Nanaimo Concert Band and a founding member of the Nanaimo Chamber Orchestra, in 2007 Farquharson started up the Island Consort chamber choir with an emphasis on excellence and Early Music. Read more about Bruce. Director Bruce Farquharson has assembled a collection of notable works, taken from each year of the choir’s 12-year history, that represent the many choral elements of the group’s performances. The Island Consort Chamber Choir is a 20-voice community chamber choir in Nanaimo, BC that first appeared in concert in late April 2007. Repertoire is performed mostly a cappella but with occasional keyboard or strings accompaniment. The choir produces two programs per year in Nanaimo, typically in late November and in mid-April. Past performances have also been in the mid-Island communities of Qualicum Beach, Parksville, Chemainus, Ladysmith and Gabriola Island. Programming retains the emphasis on Early Music (Byrd, Tallis, Weelkes, Palestrina, Monteverdi, Bach, etc.) but also expands to include Classical, Romantic and 20th Century/contemporary works (Schubert, Pearsall, Rheinberger, Kodaly, Tormis, Whitacre, etc.). The choir entered the National Choral Competition for the first time in the spring of 2013. 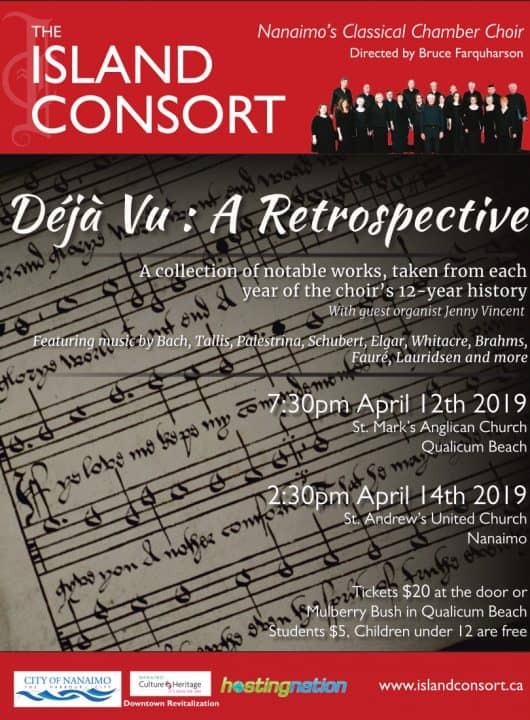 Island Consort has performed three times at the Port Theatre – with the Nanaimo Chamber Orchestra, with the Vancouver-based professional dance ensemble, “Dancers Dancing”, providing on-stage vocal accompaniment, and with the Vancouver Island Symphony’s presentation of Mozart’s Requiem. More information about past music selection can be found on our Past Concerts page.